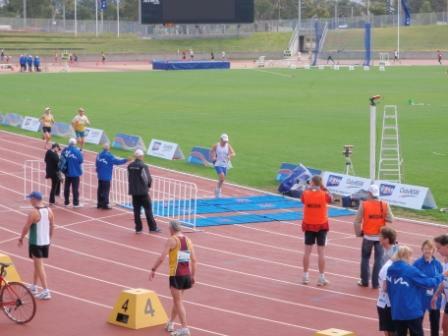 First weekend and race done – The Sydney 2009 World Masters Games have begun. After a miserable week with rain and cold weather at least most of Sunday stayed dry. Uli and I stayed at Homebush overnight to be ready for the 7am start on Sunday morning. I picked-up my accreditation card and signed in for the 10 km race that afternoon. Since the organisation of these Games are done by the government it should not surprise about the most stupid sign-up system they came up with. For each race I and all other athletes signed up for you need to show up a day prior the race to pick up your race number!?!?! This would mean for me to take off Monday and drive out to Homebush to simply sign in for my race on Tuesday morning. So of course I will give my 8 km race a miss as some of us still have to work, but even for the retiree it means they loose precious time for sightseeing by driving back and forward to sign-up for each days events. 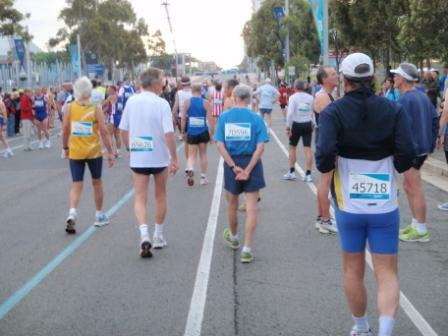 Anyway, at 7am on Sunday morning I was ready at the start of the 10km road race of the World Masters Games. A fresh but dry morning awaited a few hundred starters. Sadly only one wheelchair athletes was competing (his gold was guaranteed). 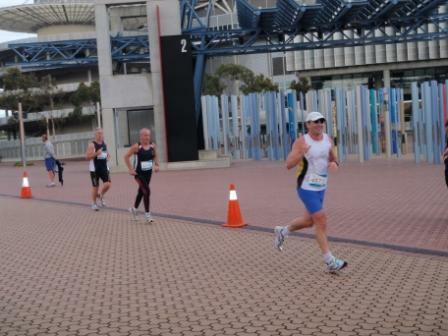 The race was 2 loops of almost 5km and then a short finish into the stadium at the end. The race number are interesting, as they show the first two digits as your age group and I can tell you it is no fun to try and keep up with number 70456 and getting overtaken by 65346 in the last 500 m of the run….there were certainly some top runners out there and even Darwin Don (80+) finished his race in under 90 min! A week of rest and recovery before I will attempt another PB with the 1/2 marathon next Sunday. The recovery is more for the hard Opening Ceremony which followed on Sunday evening. 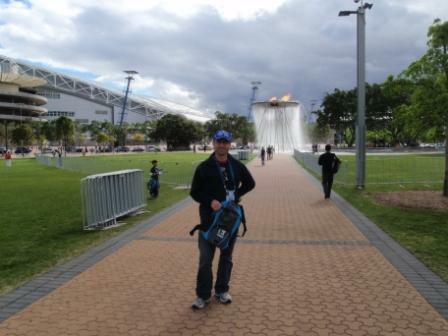 Hours after hours of waiting and catching up with fellow athletes in a waiting area before finally we marched into the ANZ (former Olympic) stadium with over 28’000 other athletes from over 95 countries. Was quite a spectacle which I will remember for ever.